Please feel free to comment, add additional resources, or share different views! Welcome to my MACUL BYOL participants! The session is called Around the World in 80 Clicks (with thanks to Silvia Tolisano). Here is the link to many Skype resources. Assignment: Please use the comment feature below to document your plans for using Skype in your classroom. Where do you want to connect? What do you want to learn from/with another class? Recently, I read this post on the Radvision blog about multi-funtion devices vs. single-function devices. While Sagee was focusing on the Flip camera vs. the iPhone and other Smartphone, I couldn’t help but think about classroom videoconferencing. Would you rather have a single device that only does one thing: videoconferencing? This is my vision for my schools: to provide a login to standards-based videoconferencing so that they can use whatever tool necessary to videoconference with whoever they want. All from the comfort of the classroom and using the “technology central tool” in their classroom. Did you see that Skype is developing their own Skype in the Classroom Directory? It’s supposed to come out in December, and you can pre-register now. I am very excited about this development. Right now there are a several scattered sites and places to find people, but one central location would be super helpful. While we’re waiting, these are the places I know of where you can find Skype partners. Do you know any others? Classroom 2.0: search the discussions for Skype. Some people post requests for partner classes here. Last week I taught 3 sessions of Skype for the first time. I found it fascinating and want to share some of the comments and reactions from my teachers. An intro to how Skype is used in the classroom: heavily dependent on pictures and videos from Silvia Tolisano. She seems to be the “queen” of Skype in the classroom as far as I can tell! We installed Skype, added contacts, practiced chatting, calling, and sending video (by muting our speakers to avoid awful audio in the room). We set the privacy settings to school recommended settings: only receiving calls or chats from my contacts. We connected to one or two people, depending on the length of the workshop. We had a lot of discussion on best practices, classroom management, comparing to H323, etc. Here are some of the areas we discussed and how the teachers reacted. Since almost everyone in my workshops were already familiar with and using their Polycom cart, they really wanted to compare! I thought I should try to teach Skype for Skype, but they asked too many questions! I ended up adding slides to my workshop PPT to compare H323 based on these two comparisons: from March 2010 and July 2010. We couldn’t talk about Skype without bringing in a conversation about H323 desktop videoconferencing. That is the “in between” solution that has the best of Skype and the best of H323. My teachers don’t want to go to just Skype. They want H323 as well, preferably in their classroom. First and foremost: they want to connect to family. One participant last week added her college age son to her Skype contact list and before the workshop was over she was talking to him at college! A journalism teacher wants to use Skype for students to interview sources for their articles. The students would do individual Skype calls. We discussed using use science fair poster boards to reduce sound challenges having more than one skype call in the classroom at the same time. She also wants to be able to record the interview for evaluation/grading. There are a lot of tools for recording – but I don’t yet know which is the best. Do you have an opinion? Please comment! Using the conference call feature (voice only) to do grade level meetings across the district. Middle school scientific data collection to increase test validity (better quality data). While I’ve heard edtech types say “Skype is easy; teachers can do it on their own”; that is not the feedback I received last week. Teachers want a “21st century learning facilitator” like Silvia Tolisano is for her school. Teachers don’t feel comfortable with the challenge of finding a partner class on their own or building their personal learning network (like Silvia has 200 people on her Skype contact list). They want help with this! One teacher, with a fairly high level of ed tech skill, confided that he found it very difficult and discouraging trying to find a partner class for a Skype project. He had tried for a full school year with no success. When they thought about registering for CAPspace or Silvia’s Around the World site, they didn’t want to get a lot of email. This again shows the need for a “coordinator” to build the network and assist. It seems that just like support is needed for H323 videoconferencing, it is essential for Skype as well. Teachers are super super excited about VC in their classroom. There are issues with vc in the library and noise if another class is there too; issues with scheduling the space (not the equipment – the space!) for VC; etc. Access in the classroom!! Tech directors are worried about the loss of capability with desktop VC compared to VC systems/carts: loss of zoom, pan, tilt, presets, ability to plug in multiple peripherals. Teachers don’t care about that. The access in their classroom is worth that loss. Before last week’s trainings, I thought I wanted to mount the webcam on the interactive whiteboard or somewhere at the front of the room. But I found all week that it was nice to be able to pick up the webcam and move it around: angle it one way or another depending on the need, etc. One participant had noticed that using the built in camera/mic on a laptop there was no echo (in his own use of VC); but more likely to get echo when using a webcam. This is an interesting observation that I would like to verify and test further. So, what do you think? Are you hearing these same kinds of reactions from your teachers? Did anything in this list surprise you? Assignment: Please use the comment feature below to document your plans for using Skype in your classroom this year. Today, we did a 5 minute call with a group of teachers in OH who learning about Skype in an afternoon workshop. Is pretty easy on Skype, but you can’t show the desktop and the video at the same time. On H323 VC carts, you can share the computer and in some cases, the computer and the video/presenter at the same time. On the H323 videoconferencing system, we could easily share the document camera by pressing a number to jump to a preset. On Skype, we are not sure. In theory a USB document camera could be shared with the other site. But do you have to disconnect or end the video part of the call to change video settings? It seems likely. The mic on our Polycom VSX 7000 is obviously designed for a whole classroom and works great. I was very surprised that the audio we were sending to the group in OH seemed to work fine from across the room. That was using the built in mic on my Mac. I also had my Mac hooked up to the SmartCart with speakers so they could hear. And that did not cause an echo for the remote site as I thought it would. I was pleasantly surprised! The group in Ohio had a hand held mic that sounded GREAT. But when they switched to their logitech mic it was kind of tinny and not as clear. I don’t know which logitech webcam they were using or how they connected the hand held mic. I would like to learn that! On both sides we had the camera set to show the whole room. Of course with Skype/webcams, we don’t have a way to do presets or easily switch to a document camera. The participants shared some of their experiences with Skype and how sometimes it’s great and other times not so much. And sometimes it won’t connect at all. We discussed how Skype is good for short learning experiences that aren’t critical/frustrating if it can’t connect right then. or have a more in depth interaction. What do you think? Do you agree? Do you have more to add to the list? Please comment! Today in the SIG IVC open house, I had a nice long chat with Joan Roehre from WI who is running Wisconsin HistoryMystery via Skype, connecting students in Guatemala to students in the U.S. and many more cool VCs. Teachers don’t get Skype on their computer until she has worked with them. She makes sure their settings are locked down to receive calls and chats only from the contact list (CRITICAL for K12 school use). When they had a T1, sometimes Skype was using 75% of the bandwidth!! Now that they have fiber it is no longer an issue. From the networking side they allow Skype and make sure it has the bandwidth it needs. The teachers aren’t sharing the desktop yet – that’s too complicated. It’s good to talk to someone who actually has it working well! I have to say that I’m still conflicted about this desktop VC thing – trying to get desktop videoconferencing to work on an interactive whiteboard installation. After the installation of the LifeSize cart last week, I keep thinking about the quality of HD videoconferencing on a 40-50 inch monitor. It looks so good! It caused such a stir of excitement among teachers and students! The quality is just great! But then there’s the fact that Skype use in schools is growing fast. I can’t ignore that! Just last week I heard from a local teacher planning to connect to a niece in China via Skype – to share with her classroom. At the elementary level (where I work) skype is SO much easier to use than Polycom. The quality is not as good, but teachers can do it on their own. With Polycom we have to bring equipment and set it up. It involves IP addresses and other things that most teachers do not understand. I love my Polycom and am so glad that our principal approved buying one of our own so we didn’t have to share with a regional group. I am so proud that any technical difficulties have been primarily on the other end and our equipment has proven to be steady and reliable. YET, what makes me keep coming back to it is my schools don’t have any money for carts! Cart installation of VC still tends to be grant driven. There must be a way to help new interested users in videoconferencing get started. Desktop VC is a way to get access when you can’t afford the full $5000-$9000 cart! It’s a great way to get started with videoconferencing and still be able to connect to all the content providers and other schools with H323 videoconferencing systems (desktop or room). What do you think? Am I crazy to keep thinking about this? 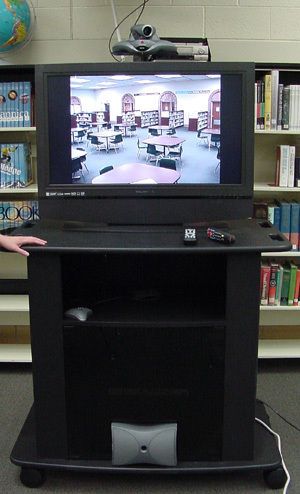 Last week I compared using Skype in the classroom to using H323 videoconferencing carts in schools. Are those our only choices? What if there was something in between? Something that any district could include when installing 21st Century Classrooms / Classrooms of Today / etc. (You know, classrooms with interactive whiteboards, short throw projectors, sound systems etc.). Something that schools could get without a grant. How many VC units do YOU know of that were installed without a grant? Not many. It’s been two years since one of our superintendents asked me how they could get videoconferencing in every classroom along with their interactive whiteboards. Since then I have not been able to stop thinking about this idea. Why can’t we have videoconferencing in all these 21st century classrooms? If we don’t think of a solution soon; they will all switch over to Skype and miss out on all the great H323 content out there. My dream is that all of the interactive classrooms in my service area will be videoconferencing-enabled! When this is possible and affordable; I think H323 videoconferencing will have a chance to become mainstream in schools – instead of just 30% penetration. As I look back at my required components from two years ago; I think we’re getting really close to meeting those. Stay tuned for further discussion as I share the results of my experimentation this year. What do YOU think? Is this an achievable goal? Is it a realistic goal? Do you see it as important or not? Why? Please comment!